University Of Iowa Press, 9781609385880, 234pp. Believe it or not, Waterloo, Iowa, had an NBA team during the league’s first season, 1949 to 1950. 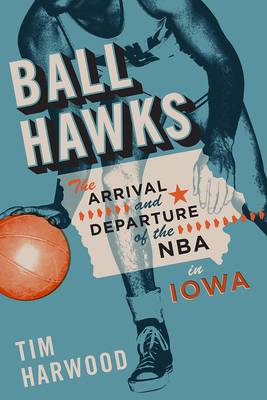 Broadcaster and independent sports historian Tim Harwood uncovers the fascinating story of the Waterloo Hawks and the Midwest’s influence on professional basketball. Beginning with the professional leagues that led up to the creation of the National Basketball Association, Harwood recounts big games and dramatic buzzer-beaters, and the players who made them. The first season of the NBA was far from a success. Teams had a hard time attracting fans, with games often played in half-empty arenas. When Waterloo residents learned that the team was struggling financially, they rallied behind the Hawks and purchased shares of the team in a bid to keep it afloat. Unfortunately, that community-based effort was not enough; owners of teams in larger markets pressured the league to push Waterloo—and other smaller towns like Anderson, Indiana, and Sheboygan, Wisconsin—out of the league. Though the Hawks disappeared after their lone NBA campaign, Waterloo and other midwestern teams were nonetheless integral to getting the NBA off the ground, and their legacy continues today through some of the current franchises that relocated to larger markets. Combining newspaper accounts and personal interviews with surviving players, Harwood weaves a fascinating story of the underdog team, in the unlikeliest of places, that helped make professional basketball the worldwide success it is today. Tim Harwood is a broadcaster and writer who has covered sports in northeast Iowa since 2005. He lives in Cedar Falls, Iowa.